John Logie Baird was allowed to use one of BBC radio's main transmitters to make a demonstration transmission for BBC engineers. Experimental programmes were transmitted using a 30-line system. The BBC decided to set up its own TV studio in Broadcasting House. A government committee recommended the immediate introduction of a public television service. Closed circuit transmissions were demonstrated at the Radiolympia exhibition using the Baird 240-line and Marconi EMI 405-line systems. The Baird system was subsequently destroyed by fire which ultimately led the Postmaster General to later opt for the Marconi EMI system, using 50 frames/second. The BBC, the world's first high-definition transmission service, was officially launched from a small studio at Alexandra Palace although only 300 receivers were available to pick up transmissions. The BBC acquired its first mobile unit for outside broadcasts. Three cameras were used to film King George VI's coronation. BBC TV's principle of Sunday night television drama was established by Cecil Madden. The first programme featured Pirandello's Henry IV. Freak weather conditions allowed British TV signals to be received in New York, the first transatlantic TV transmission, albeit unplanned. The Earl of Listowel, Postmaster General, re-opened the BBC TV service at 3p.m. One of the programmes shown was the cartoon that was interrupted in 1939. The transmission range was about a 40-mile radius from Alexandra Palace using 405-lines, 50 frames/second interlaced. One of the most successful pre-war and early post-war programmes was 'Picture Page', a one-hour programme twice weekly, covering various subjects with studio guests, presented by 'The Switchboard Girl' Canadian Joan Miller, and later Joan Gilbert. The first televised church service was broadcast from St.George's Chapel, Windsor. At the start of the year TV licences issued had risen to 54,000, to reach 61,000 by August and over 90,000 by late 1949. The BBC established a Broadcasting Centre in the building that had been the Palace of Arts in the 1924 British Empire exhibition in order to be closer to the Olympic Games at Wembley and a special television cable was laid to the stadium. The standardisation of the 405-line system was announced by the Postmaster General. The BBC bought Lime Grove studios from Gaumont-British. The LCC approved plans for a new Television Centre at White City. In the Autumn the first regional transmitter opened in Sutton Coldfield to service Midlands viewers. Combined sound and television licence issues had risen to 1,457,000 and was to top 2.1 million twelve months later as many Brits purchased televisions in anticipation of the Coronation. It is estimated that 56% of the adult population watched the Coronation on television. A 14" Bush television set sold for about 84 gns. The BBC carried out tests on the feasibility of a schools television service. Television programmes from France were transmitted by the BBC, the first time foreign TV standards had been converted for use. The first broadcast was made from a ship at sea. The BBC decided to replace the Alexandra Palace transmitter with a more powerful unit sited at Crystal Palace. Part of the White City complex began to be used. Early in the year the Conservative government introduced a bill to allow the introduction of independent television companies which led to the formation of the National Television Council and the Popular Television Association, the NTC being opposed to commercial television broadcasts. Thorn Electrical and Sylvania Electric Products Inc announced plans to set up a UK company to develop colour television. The ITA started an inaugural service from Norwood. ITV officially opened at 7:15 p.m. when a dinner to celebrate the occasion was televised from The Guildhall, London. The transmission also included the first TV commercial - for Gibbs SR toothpaste - at 8:12 p.m. and the first TV news at 10 p.m. read by Chris Chataway. In 1958 Granada covered the Rochdale by-election, the first election to be shown on British television. June 6th 1961 (Tuesday) In the U.K. the commercial television franchise for north and west Wales was awarded to Teledu Cymru, the Wales Television Association, and would go on the air on September 14th, 1962. It failed in less than three years. During 1966, in order to make division of the London franchise area more equal, the weekend franchise company was permitted to take over transmissions at 7p.m. on Friday evenings instead of the previously contracted Saturday mornings. In Spring/Summer 1967 the ITA invited applications for new 6-year contracts to be awarded to independent stations starting in July 1968. There were a total of 36 applications from 16 new groups and the 14 current holders. ITA chairman Lord Hill announced the winners in June after which he was controversially moved to the chairmanship of the BBC by Prime Minister Harold Wilson. He was succeeded at the ITA by Lord Aylestone. Ampex shared VTR patents with Sony, who reciprocated with information on transistorised circuitry. 7th March The first rules governing violence on British television were issued to the BBC by Controller of Programmes Kenneth Adam. In September 1960 the maximum time for commercials in any one hour was reduced to seven and a half minutes in September, and seven minutes on Christmas Eve. The number of internal breaks was also reduced - previously an hour long programme had three breaks, now only two were permitted. The television companies made sure they didn't lose out as they raised the price of their ad time slots to compensate. In 1961 a Daily Express poll asked 1450 housewives what they did during commercial breaks: 30% did knitting / sewing / darning, 23% continued watching the TV, 19% did household chores, 13% did cooking, 8% looked after the children, 7% ate during the break. JVC (founded as the American-owned Victor Co. of Japan in 1946 but owned by Matsushita since 1953) demonstrated helical scan colour VTR with 2 heads. Sony marketed helical scan VTR - the PV100 - adopted by American Airlines in 1964 for in-flight movies. Television advertising duty was imposed for the first time. Border TV and Grampian TV came into operation. 18th March The Avengers were first shown on television starring Ian Hendry and Patrick Macnee. Honor Blackman's Cathy Gale replaced Ian Hendry in 1962. 83 episodes were made, 57 in colour. 27th June The Pilkington Report was published, recommending the introduction of colour television licences and that Britain's third national television channel should be awarded to the BBC. It also criticised the populism of ITV by attacking its American programming content such as Westerns and crime series and recommended that the BBC should create local radio stations in order to prevent the introduction of commercial radio. The new Television Act was introduced with the ITA code for programme makers giving guidance on rules for portrayal of violence and on general standards and practice. The Authority got stronger powers over programme schedules, advertising content and timing. 'AdMags' such as Jimmy Hanley's 'Jim's Inn' were barred from television. 'Jim's Inn' first appeared in spring 1957 and ran for 300 editions. It relied on a strong and believable story line, recognisable characters and the warm personality of the landlord. Wide ranges of products, from the familiar to the outlandish were skilfully woven together each week. The first real pop music used in commercials when cartoon Beatles launched Nestle's Jellimallo bar. The Rolling Stones did backing music for Rice Krispies in a cartoon parody of Juke Box Jury and Cliff, Craig Douglas, Acker Bilk and Lonnie Donegan all featured in a 'live action' commercial for Quaker Puffed Wheat - 'A swinging way to start the day' - voiced over by D.J. Brian Matthew. Sony marketed the first 'home' VTR in the USA for $995, with an open reel 1/2inch helical scan deck. 16th May The transmission made to cover the launch and recovery of Gordon Cooper's spaceshot was the first to use two satellites simultaneously, Telstar 1 and Telstar 2, and the Faith 7 craft transmitted the first TV pictures from space. 24th June The first British domestic television recorder, TELCAN, was demonstrated at Alexandra Palace. Part of the 9 o'clock news programme was recorded and re-transmitted on the same programme. 26th July Syncom was launched, the first geo-synchronous satellite. Syncom 2 was launched later in the year, carrying the first live two-way call between heads of state. Syncom 3 carried live TV coverage of the 1964 Tokyo Olympic Games. The Sony helical scan open deck VTR PV100 was adopted by American Airlines for in-flight movies. Ampex joined with Toshiba to market U.S.-designed VTRs in Japan. Instant replay was first used by the BBC for The Grand National. Valerie Martin was the first winner of the 'Miss TV Times' competition. The first (and only) ITV company to fail, Wales West and North (WWN), was taken over by Television Wales and West (TWW). A new Television Act included a code of advertising standards and combined the 1954 and 1963 Acts. Mary Whitehouse established the Clean Up TV campaign, later the National Viewers and Listeners Association (NVLA) and now Mediawatch-UK. 21st April BBC2 started broadcasting (on 625 lines) from Crystal Palace. It was originally planned to broadcast the previous day but a major power failure foiled that plan. The existing BBC TV channel was renamed BBC1. Sony introduced the first consumer 1/2inch format helical scan VTR priced under $3000. 2nd January Saw the first transmission of 'World Of Sport'. 24th March Transmission of TV pictures from the moon received as Ranger 9 impacts with the surface. 6th April Early Bird - Intelsat 1 was launched, the first commercial communications satellite. Built by the Hughes Aircraft Company it supported 240 telephone lines or one television channel. Designed for an 18 month lifespan, it lasted for 3.5 years. 2nd May The first transatlantic television programme was transmitted via Early Bird. Called 'Out Of This World' it contained elements supplied by many different countries. 17th May The first transatlantic colour television programme was transmitted via Early Bird, a 30 minute show primarily for U.S. viewers called 'A New Look At Olde England'. 30th May - 17th June The first sport was transmitted via satellite when the BBC showed world championship football from Chile via Telstar. 1st August The broadcast receiving licence for radio was increased to £1.5shillings. The combined TV / radio licence was increased to £5. 20th December The Belmont transmission mast, near Donington, opened, thought to be the highest construction of its kind in the world. It was a tubular pipe 900ft long by 9ft in diameter, surmounted by a 365ft lattice upper section. In September 1967 meteorological equipment was added, raising its height to 1,272ft (388m). Richard Burton and Elizabeth Taylor were members of the consortium that started up HTV. LWT acquired the rights to cricket's 'Gillette Cup'. The MCC was furious when ITV interrupted play for ads and took the sport back to the BBC, prompting an ITV lawsuit. The Sooty Show ended its run on BBC but was picked up and continued by Thames Television when it started in 1968. In March 1967, the Ampex HS-100 colour video magnetic disc recorder was used for rapid playback in normal, slow or stop action at the ABC 'World Series of Skating' in Vail, Colorado, heralding the start of 'instant replay' on commercial television. 3rd July News At Ten was introduced by ITN. It was the first news bulletin to feature two newscasters, Alastair Burnet and Andrew Gardiner. It was also the first 30 minute news show on a major TV channel in the UK. CBS introduced EVR using film in a cassette. 20th Century Fox agreed to sell films in EVR but were to face growing competition from VCR formats introduced by RCA, Sony, Ampex and Avco. RCA demonstrated SelectaVision that played pre-recorded cassettes but did not record. Sony introduced the first videocassette, the 3/4inch U-Matic one hour tape, available in the U.S. by 1971. For the first time, Sony allowed other manufacturers to sell machines that could play the tapes, setting the first world standard for the 3/4inch videocassette. The last year of the decade saw the revival of an old classic - 'This Is Your Life' - by Thames Television. The show had previously run from 1953 to 1964 with exactly the same presenter - Eamonn Andrews. 21st February The first time that the interior of Buckingham Palace had been televised. 19th March The ITA transmission mast at Emley Moor collapsed due to guy failure caused by icing and high winds. 20th July ITV's first major ratings clash with the BBC came when the two organisations went 'head to head' with coverage of the first manned lunar landing. 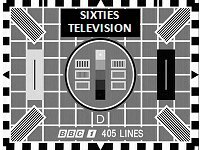 The tape of ITV's coverage has since been erased so it could be re-used, along with many other programmes of the 1960s. 3rd October 'Hawaii Five-O' first shown on LWT. It starred Jack Lord, James MacArthur, Kam Fong, Richard Denning, Peggy Ryan and Linda Ryan. 15th November The first colour commercial - Bird's Eye peas - was shown by ATV Midlands at 10:05 a.m. during 'Thunderbirds'. The same commercial was shown in the London area at 11:00 the same day at the start of their colour television transmissions. 25th December The last live broadcast of The Queen's Christmas message. All subsequent ones have been pre-recorded. A for Andromeda (BBC 1961) Only the last five minutes have survived. Doctor Who The Tenth Planet episode 4 (BBC 1966) The last Hartnell adventure featuring the famous regeneration scene. Out of the Unknown series 3 (BBC 1969) Only one episode has survived. The Likely Lads (1964-66) Many episodes are missing, although some are gradually being discovered. On the Margin (BBC 1966) Alan Bennett's musical comedy. Till Death Us Do Part (1966-75) Many early shows are missing. Juke Box Jury (1959-67) Only two episodes exist from the Sixties, but not the show where the panel of judges were The Beatles. Thank Your Lucky Stars (ABC 1961-66) Virtually nothing has survived. Sunday Night at the London Palladium (ATV 1955-65) Very few editions have survived. Opportunity Knocks (ABC 1956-77) TV Debuts for many top artistes, but hardly any have been preserved. The Moon Landing (July 1969) The live commentary by Patrick Moore and James Burke in the BBC studio (wiped). News at Ten (ITN 3rd July 1967) The first ever edition. A Tale of Two Cities (BBC 1965) Many other Sunday tea-time classics are also missing. Emergency Ward 10 (ATV 1957-67) Very few have survived. Jazz Goes to College (1966-67) The entire series is missing. The Crucible (Granada 1959) Starring Sean Connery and Susannah York. This show exists, but minus the last 18 minutes.